Description : frontis., -37 p. ; ill.: 1 phot. ; 21 cm. Photograph : 1 vignetted portrait, collotype. Photographer : Benjamin Jake Falk (1852-1925). Subject : Medicine — Practice. Author caption: By Austin Flint (Senior) M. D., LL. D.
Medical degree, Harvard Medical School, 1833. Professor, institutes and practices of medicine, Rush Medical College, Chicago, 1845. Cofounder, Buffalo Medical College, 1847. Professor, theory and practice of medicine, University of Louisville, Ky., 1852-1856. Chair of pathology and clinical medicine, Buffalo. Professor, clinical medicine, School of Medicine, New Orleans, 1858-1861. Professor, pathology and practical medicine, Long Island College Hospital, 1861-1868. Visiting physician, Bellevue Hospital, 1861-1886. 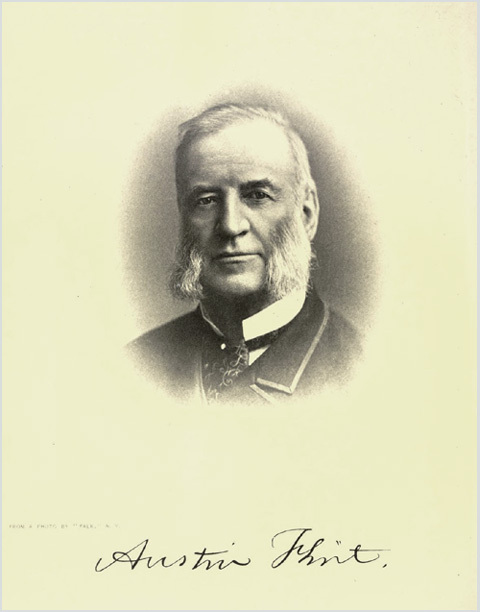 President, New York Academy of Medicine, 1872-1885. President, American Medical Association, 1884. Professor, principles and practice of medicine, Bellevue Hospital Medical College, 1886. Subtitle: An address prepared for the annual meeting of the British Medical Association in 1886. Eponym: Flint's murmur–mitral heart murmur. Eponym: Flint's arcade–arteriovenous arch, base of the renal pyramid. Eponym: Flint's law–elevation of pitch, with diminution of resonance, resulting from pulmonary consolidation. Photo caption: From a photo by "Falk." N. Y.